Published: Dec. 21, 2016 at 02:43 p.m. Updated: Dec. 21, 2016 at 02:51 p.m.
You're in good hands, NFL. It's the most important position in football -- and the most enigmatic. Michael Silver talks to players, coaches and executives about a nearly impossible job: quarterbacking an NFL team in 2016. A year after Peyton Manning's retirement, and with the knowledge that Tom Brady, Drew Brees and Aaron Rodgers can't last forever, the league is celebrating a new wave of quarterbacks threatening to carry a well-lit torch for the next couple of decades. For proof, check out the current NFL standings. 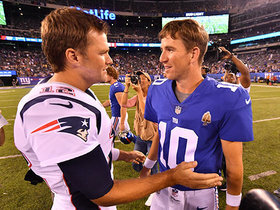 Of the quarterbacks who entered the league in the last three years, five have their teams in first place or within a game of the division lead. That's a lot of young talent we'll potentially be seeing in the playoffs this season. 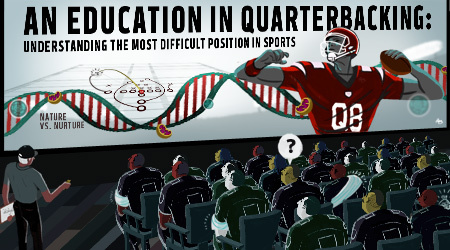 Quarterbacks today are much more ready for the rigors of the NFL than they were even 10 years ago. Pro-style college offenses, 7-on-7 developmental competition and improved QB coaching have prepared them well, and it's showing in their quick development. Drafted in: Round 2 (No. 36 overall) in 2014. 2016 statistics: 14 starts (11-3 record), 63.5 completion percentage, 3,705 yards, 25 TDs, 6 INTs, 95.2 passer rating. Three-year statistics: 46 starts (21-25), 60.8 completion percentage, 10,962 yards, 78 TDs, 31 INTs, 87.3 passer rating. Evaluation: Good athlete with a strong arm and leadership skills. Was very productive as a college quarterback. 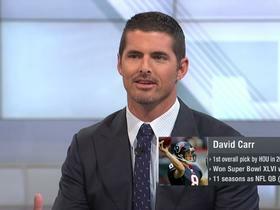 Outstanding person; I've known him personally for many years, even before he got to Fresno State, because of his brother, former NFL quarterback David Carr. Had a poor performance against USC in the Las Vegas Bowl in 2013 that most likely kept him out of Round 1. Over the past two years in Oakland, he has 57 touchdown passes and has won 18 of his 30 starts (.600). It will mark the first time since Rich Gannon in 2001-02 that a Raiders quarterback has won more than 50 percent of his games over a two-year stretch. Drafted in: Round 1 (No. 2 overall) in 2015. 2016 statistics: 14 starts (8-6), 62.2 completion percentage, 3,327 yards, 25 TDs, 9 INTs, 96.7 passer rating. Two-year statistics: 26 starts (11-15), 62.2 completion percentage, 6,145 yards, 44 TDs, 19 INTs, 94.3 passer rating. Evaluation: The Heisman Trophy winner out of Oregon had a win-loss record in college of 36-5. Special as an athlete, with top speed. Has the outstanding skills needed for the position. I thought it might take him at least a year to adjust to the pro game, because he didn't call his own plays at Oregon and operated exclusively out of the shotgun, but that wasn't the case. In fact, in his first career NFL game, he threw four touchdown passes against Tampa Bay. The Titans' eight wins this season are three more than they've had the previous two years combined, and Mariota has them in the playoff hunt with two games to go. Drafted in: Round 4 (No. 135 overall) in 2016. 2016 statistics: 14 starts (12-2), 67.7 completion percentage, 3,418 yards, 20 TDs, 4 INTs, 103.2 passer rating. Evaluation: Very athletic and smart, and reads defenses well. Productive player who makes plays with his arms and his feet. He has a long history of being a winner. Led Mississippi State to 20 victories over a two-year stretch. In his first season in the NFL, he has had a 100-plus passer rating in 10 of 14 games. His 88.9 completion percentage against the Buccaneers on Sunday (32 of 36) was the second-highest in NFL history for a quarterback with at least 30 attempts. Drafted in: Round 1 (No. 1 overall) in 2015. 2016 statistics: 14 starts (8-6), 60.8 completion percentage, 3,611 yards, 25 TDs, 15 INTs, 87.2 passer rating. Two-year statistics: 30 starts (14-16), 59.5 completion percentage, 7,653 yards, 47 TDs, 30 INTs, 85.6 passer rating. Evaluation: Not as athletic as Mariota or Prescott, but very smart and has good work habits. Had a 4.0 GPA out of high school, choosing Florida State over Stanford. Won a national title and Heisman Trophy in college. Great leadership skills. Good, plus arm strength. Has mental toughness. Made Pro Bowl as a rookie. Has led the Bucs to 14 wins over first two seasons. Drafted in: Round 1 (No. 2 overall) in 2016. 2016 statistics: 14 starts (5-9), 62.8 completion percentage, 3,385 yards, 13 TDs, 13 INTs, 78.5 passer rating. Evaluation: Very good athletic ability, with intelligence and speed. Eagles lack big-play players, which hinders his performance. Has a strong arm with running ability. Started NFL career quickly but hit a valley most rookie quarterbacks hit. Appears to have rebounded in recent weeks. Will be a good NFL quarterback for a long time. Looks the part. Drafted in: Round 2 (No. 62 overall) in 2014. 2016 statistics: 2 starts (2-0), 70.0 completion percentage, 496 yards, 4 TDs, 0 INTs, 117.1 passer rating. Three-year statistics: 2 starts (2-0), 68.1 completion percentage, 684 yards, 5 TDs, 0 INTs, 108.5 passer rating. Evaluation: Started and won two games for the Patriots this season before getting injured. Has good arm strength and running ability, and is tough; was a linebacker in high school before moving to quarterback. Confident, smart player. Will be a good NFL player, but he needs to get out of the shadow of Tom Brady. Has starter traits. Wouldn't surprise me if a team like Cleveland traded for him this offseason. Drafted in: Round 1 (No. 32 overall) in 2014. Three-year statistics: 28 starts (17-11), 64.9 completion percentage, 6,150 yards, 28 TDs, 21 INTs, 87.0 passer rating. Evaluation: This ranking is based on the assumption Bridgewater returns to full health from the dislocated knee and torn ACL that ruined his 2016 season. He led the Vikings to 11 wins in 2015, passing for 3,231 yards, 14 touchdowns and nine interceptions. His statistics were good, not great, mainly because Minnesota ran the ball 53 percent of the time. Good accuracy and ability to run. Has the skills to win in this league with a team that surrounds him with talent. Not sure he would ever be the centerpiece of an offense. Drafted in: Round 1 (No. 1 overall) in 2016. 2016 statistics: 5 starts (0-5), 54.7 completion percentage, 879 yards, 4 TDs, 5 INTs, 65.7 passer rating. Evaluation: He has skills, but he's playing on a very poor team with no offensive threats. Has athletic ability and good arm strength. His ranking here is all based on potential, because he hasn't played enough in the NFL to make a definitive evaluation. Drafted in: Round 7 (No. 250 overall) in 2015. 2016 statistics: 12 starts (7-5), 61.3 completion percentage, 3,012 yards, 16 TDs, 8 INTs, 88.1 passer rating. Two-year statistics: 12 starts (7-5), 61.3 completion percentage, 3,012 yards, 16 TDs, 8 INTs, 88.1 passer rating. Evaluation: Because of injuries that kept him out of pre-draft showcase opportunities, not many teams had a good feel for him going into the 2015 NFL Draft. He sat his entire rookie season, but he was given the starting job in 2016 when Peyton Manning retired. A tough evaluation after one year because he has no running game and is working behind a poor offensive line. Has a good but not great arm. Very accurate and smart. Will compete. Drafted in: Round 1 (No. 3 overall) in 2014. 2016 statistics: 12 starts (2-12), 57.8 completion percentage, 3,279 yards, 21 TDs, 16 INTs, 75.8 passer rating. Three-year statistics: 43 starts (10-33), 58.4 completion percentage, 10,615 yards, 67 TDs, 51 INTs, 78.6 passer rating. Evaluation: Tough to figure out. Has played on a very poor team. Intriguing player with good arm strength and touch. Did very well in the athletic drills at the NFL Scouting Combine. Needs a quarterback coach or a head coach with QB-teaching skills who can develop him. There's a lot there to develop. He didn't play in a pro system at Central Florida and didn't receive the type of coaching that a player like Prescott has received in Dallas, a team with three former NFL quarterbacks on the staff. Plan was to sit him for his entire rookie season, but that didn't happen. In his case, it might have hindered his progress. Had a good year in 2015 with 35 touchdown passes but regressed this season. Drafted in: Round 4 (No. 135 overall) in 2014. 2016 statistics: No starts (1 game), 23 of 36 (63.9 percent) for 260 yards, 0 TDs, 0 INTs, 85.4 passer rating. Three-year statistics: No starts (3 games), 33 of 55 (60 percent) for 387 yards, 0 TDs, 1 INT, 73.8 passer rating. 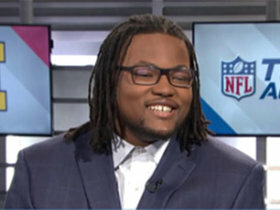 Evaluation: Has not played a lot in either college or the NFL. Played at three different schools. Reminded me a lot of former Cowboys quarterback Troy Aikman when he was coming out, in terms of arm strength, velocity on the ball, height and weight and character. Certainly not as accurate as Aikman. Injured in 2015. Needs the reps, and it looks like he'll get them now that he's been named the starter. Bill O'Brien does a great job developing quarterbacks. I've been excited about Savage since watching him as a senior and getting to know him through the draft process. What he did in his first extensive action last week should get a lot of people excited. Drafted in: Round 1 (No. 26 overall) in 2016. 2016 statistics: 2 starts (1-1), 59.0 completion percentage, 497 yards, 2 TDs, 1 INT, 79.2 passer rating. Evaluation: Has athletic ability for his size and a quick release. Can throw on the move. Needs lots of work. Turned around poor program at Memphis. Threw for 384 yards and three touchdowns in a stunning victory over highly ranked Ole Miss in 2015, a performance that gives you hope he can develop into an NFL quarterback one day.